Estimates are designed to help buyers gauge what sort of sum might be required for the purchase of a particular lot. The lower estimate may represent the reserve price and certainly will not be below it. Estimates do not include the Buyer's Premium. They are in no sense definitive. The Buyer shall pay the hammer price together with a premium thereon of 18%. We are, primarily, agents for the seller. We are dependent on information provided by the seller and whilst we may inspect lots and act reasonably in taking a general view about them we are normally unable to carry out a detailed or any examination of lots in order to ascertain their condition in the way in which it would be wise for a buyer to do. Intending buyers have ample opportunity for inspection of goods and, therefore, accept responsibility for inspecting and investigating lots in which they may be interested. Please note carefully the exclusion of liability for the condition of lots contained in the Terms & Conditions. Neither the seller nor we, as the auctioneers, accept any responsibility for their condition. In particular, mechanical objects of any age are not guaranteed to be in working order. However, in so far as we have examined the goods and made a representation about their condition, we shall be liable for any defect which that examination ought to have revealed to the auctioneer but which would not have been revealed to the buyer had the buyer examined the goods. Additionally, in specified circumstances lots misdescribed because they are 'deliberate forgeries' may be returned and repayment made. There is a 14 days time limit. (The expression 'deliberate forgery' is defined in our Terms & Conditions). Buyers intending to export goods should ascertain whether an export license is required and whether there is any specific prohibition on importing goods of that character. Ask us if you need help. Commission bids may be left with the auctioneers indicating the maximum amount to be bid excluding buyers' premium. They will be executed as cheaply as possible having regard to the reserve (if any) and competing bids. If two buyers submit identical commission bids the auctioneers may prefer the first bid received. Please enquire in advance about our arrangements for the leaving of commission bids. (b) confirm that you are authorized to provide these credit card details to Pasarel Ltd through www.invaluable.com and agree that Pasarel Ltd are entitled to permit the shipping of the goods to the card holder name and card holder address provided in fulfilment of the sale. 1. PayPal & Credit card - Eligible for payments up to $1,500.00 (surcharge of additional 4%). Bank: Union Bank of Israel Ltd. Address: 17 Shtamper Street, Netanya, Israel. We pack and ship all lots worldwide at cost. All overseas buyers will receive a shipping quote with the post-sale invoice. We ship all parcels with EMS (Express mail service) special delivery. Insurance, import duties, taxes and charges are not included in the item price or shipping charges, these are the buyer's responsibility. Pasarel Ltd carries on business with bidders, buyers and all those present in the auction room prior to or in connection with a sale on the following General Conditions and on such other terms, conditions and notices as may be referred to herein. (b) No purchase can be claimed or removed until it has been paid for. (b) We shall, as agent for the seller and on our own behalf pursue these rights and remedies only so far as is reasonable to make appropriate recovery in respect of breach of these conditions. The seller warrants to the auctioneer and you that the seller is the true owner of the property consigned or is properly authorized by the true owner to consign it for sale and is able to transfer good and marketable title to the property free from any third party claims. Notwithstanding the preceding Condition, any lot which proves to be a deliberate forgery (as defined) may be returned to us by you within 14 days of the auction provided it is in the same condition as when bought, and is accompanied by particulars identifying it from the relevant catalogue description and a written statement of defects. If we are satisfied from the evidence presented that the lot is a deliberate forgery we shall refund the money paid by you for the lot including any buyer's premium provided that (1) if the catalog description reflected the accepted view of scholars and experts as at the date of sale or (2) you personally are not able to transfer a good and marketable title to us, you shall have no rights under this condition. The right of return provided by this Condition is additional to any right or remedy provided by law or by these Terms & Conditions. Lot 1: Pair of Sterling Silver Candlesticks. Description: Pair of Sterling Silver Candlesticks. Marked. Height: 36.5cm. 680gr. Lot 2: Silver Flatware Cutlery Set, 20pcs, Germany, Circa 1900. Description: Silver Flatware Cutlery Set, 20pcs, Germany, Circa 1900. Including 10 forks (19.5cm) and 10 spoons (19.5cm). Marked. 1021gr. Lot 3: Puiforcat Sterling Silver Pair of Three Light Candelabras, Paris, France, Circa 1900. Lot 4: Sterling Silver Six Light Candelabra. Description: Sterling Silver Six Light Candelabra. Marked. Height: 35cm. 698gr. Minor repair. 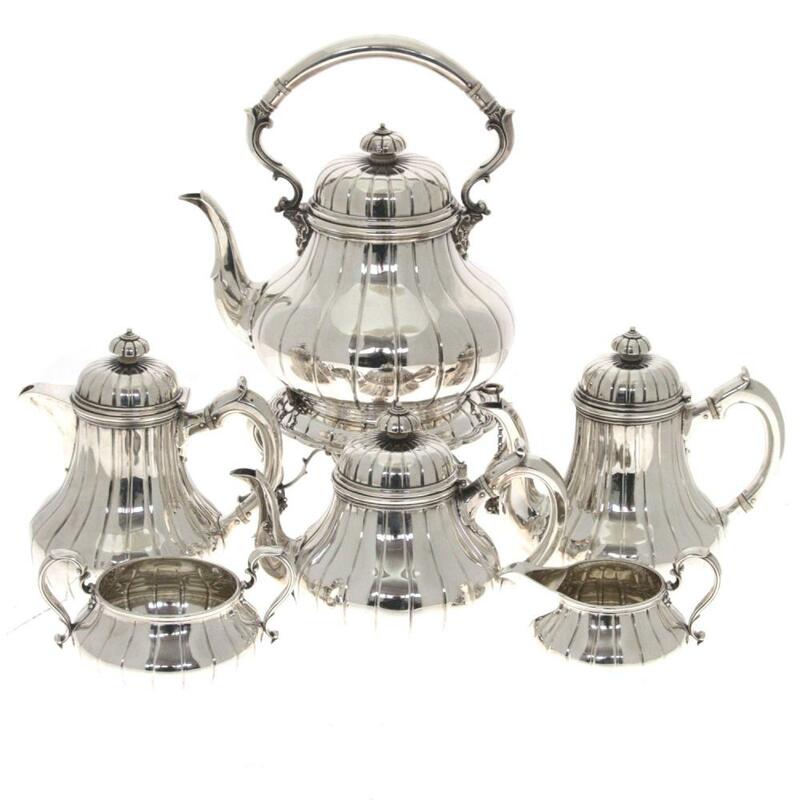 Lot 5: Garrard & Co Sterling Silver 6pcs Tea and Coffee Set, London, England, 1910. Lot 7: American Sterling Silver Footed Serving Bowl / Tray, Meriden Brittania Company, Connecticut, Circa 1900. Lot 8: Hazorfim Sterling Silver Wine Bottle Coaster. Description: Hazorfim Sterling Silver Wine Bottle Coaster. High Relief ornaments of apples, strawberries and pears. Marked. Height: 5.5cm. Diameter: 14cm. 193gr. Lot 9: Pair of Silver Candlesticks. Description: Pair of Silver Candlesticks. Marked (800). Height: 28.5cm. 365gr. Minor dings. Lot 10: Set of Silver Flatware, 142pcs, M.H. Wilkens & Sohne, Bremen, Germany, Early 20th Century. Lot 11: Large and Impressive Sterling Silver Centerpiece. Lot 12: Three Russian Silver and Niello Glass Holders, Moscow, Post 1958. Description: Three Russian Silver and Niello Glass Holders, Moscow, Post 1958. Niello ornaments. Marked (875). Height: 8.5cm. 240gr. Lot 13: Three Silver Serving Tongs. Description: Three Silver Serving Tongs. Length: 11-22cm. 146gr. Lot 14: Silver Fish Flatware Cutlery Set. Description: Silver Fish Flatware Cutlery Set. Including 12 fish forks (17.5cm) and 12 fish knives (21cm). Marked (800). 1044gr. Lot 15: Silver Table Clock, Switzerland, 20th Century. Description: Silver Table Clock, Switzerland, 20th Century. Marked. 7.5x7cm. Lot 16: Gorham Sterling Silver Basket Bowl, 1908. Lot 17: Sterling Silver Three Light Candelabra, Emil Hermann, Germany, 20th Century. Description: Sterling Silver Three Light Candelabra, Emil Hermann, Germany, 20th Century. Marked. Height: 18cm. 245gr. Minor repair. Lot 18: Silver Flatware Cutlery Set, 12pcs, Wilhelm T. Binder, Germany, Circa 1900. Description: Silver Flatware Cutlery Set, 12pcs, Wilhelm T. Binder, Germany, Circa 1900. Including 6 forks and 6 spoons (21cm). Marked. 825gr. Lot 19: Sterling Silver Tray. Description: Sterling Silver Tray. Grape clusters and vine ornaments. Marked. Diameter: 22cm. 165gr. Lot 20: Persian Style Silver Vase. Description: Persian Style Silver Vase. Bird, floral and foliage ornaments. Marked. Height: 20cm. 230gr. Lot 21: Tamas Galambos (Hungarian, b.1939) - Puppet Theater, Pencil on Paper, 1996. Description: Tamas Galambos (Hungarian, b.1939) - Puppet Theater, Pencil on Paper, 1996. Signed and dated. Titled on the reverse. 29x40cm. Lot 22: Tamas Galambos (Hungarian, b.1939) - Pastel on Paper, 1995. Description: Tamas Galambos (Hungarian, b.1939) - Pastel on Paper, 1995. Signed and dated. 50x35.5cm. Lot 23: Tamas Galambos (Hungarian, b.1939) - Pastel on Paper, 1995. Description: Tamas Galambos (Hungarian, b.1939) - Pastel on Paper, 1995. Signed and dated. 50x33cm. Lot 24: Tamas Galambos (Hungarian, b.1939) - Riding the Peacock, Ink on Paper, 1995. Description: Tamas Galambos (Hungarian, b.1939) - Riding the Peacock, Ink on Paper, 1995. Signed and dated. Titled on the reverse. 34x48cm. Lot 25: Tamas Galambos (Hungarian, b.1939) - Oil on Canvas. Description: Tamas Galambos (Hungarian, b.1939) - Oil on Canvas. Signed. Framed. 59x49cm. Frame: 67x57cm.